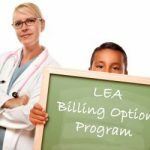 Updated Policy Regarding Prescriptions for Physical Therapy (PT) and Occupational Therapy (OT) Treatment Services under the LEA Medi-Cal Billing Option Program. Prescriptions for PT and OT treatment services, as required by Title 22, California Code of Regulations, Section 51309(a), may come from physicians employed by or contracted with the LEA, or may come from the student’s primary care physician, dentist or podiatrist. A prescribing physician does not need to be the student’s primary care physician, and does not need to personally evaluate the student to issue a prescription for PT or OT treatment services. However, the prescribing physician must have a working relationship with the LEA and treating physical/occupational therapist, and must review the student’s records prior to prescribing services. Prescriptions for treatment plans are limited to six months and must be renewed for medical necessity.